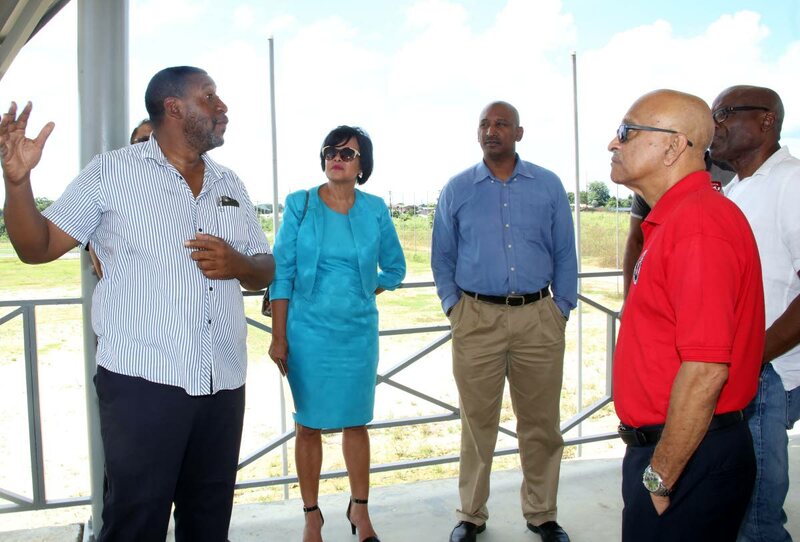 TTFA president David John-Williams (left) speaks to representatives from local sporting bodies, including Dr Patricia Butcher (netball), Robert Farrier (cycling) and Dudnath Ramkessoon (cricket), during yesterday’s tour of the Home of Football. President of the TTFA David John-Williams, revealed the price tag of the facility yesterday in a conversation with Newsday during a tour of the “Home of Football”, which is located next to the Ato Boldon Stadium in Couva. John-Williams responded to claims of being secretive on the specifics of building the facility, dismissing them as mischief. “I have absolutely no problem with transparency in this project. But we took a different approach that a lot of people are not too happy with,” John-Williams said. John-Williams expressed pride and gratitude for the progress the multi-million-dollar building project has made, boasting that building would be completed by the end of November, and that final touches would be done by February 2019. Yesterday, during the tour, John-Williams showed off all the sections of the complex, which include a hotel, an entertainment centre and training grounds. “This is the future of Trinidad football...This is the future of Trinidad sport!” John-Williams said as he displayed the facility to stakeholders. During the tour he explained the complex was built using ICF technology, which utilises blocks of Styrofoam filled with concrete to make a cheap, easy-to-use, lightweight and durable building block. He said the blocks would insulate the facility from heat from the outside, making rooms “exceptionally cool.” The largest rooms in the hotel are about 24 feet long by 25 feet wide, Newsday was told. He said despite the speed at which the buildings were erected, there were no more than 20 contractors working on the site each day. John-Williams thanked the Government and FIFA for their investment in TT football. The Government supplied the TTFA with the 17.5 acre parcel of land on which the facility stands. The Home of Football project, he said, was the first fully funded FIFA Forward project — the organisation’s initiative to provide 360-degree, tailor-made support for football development. “This is of an international standard and I think this is what the sporting fraternity would want,” said Dr Patricia Butcher, president of the TT Netball Association. Reply to "US$2.5m for Home of Football"